When it comes to finding the perfect wedding catering it can often become a difficult task, especially if you’re trying to please everyone. A wedding day is for the bride and groom and this means that you should have the catering which you like best, even if that is a hog roast from Ruthin. You don’t need to worry that you can’t have hog roast because you have vegetarian guests, we always provide a vegetarian option so there is no need to worry about any vegetarian guests that you have. 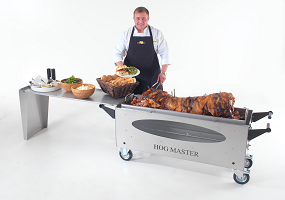 If you want to choose a hog roast for your wedding catering then you shouldn’t allow anything to stop you from having the food that you love best. You can choose between many different menus with informal buffet styles or formal sit down meals, there are many different variations allowing you to choose the one which suits you best. If you are looking for hog roast catering Ruthin offers the expert services which we provide at Taste the Cracklin. Giving you the very best catering with food locally sourced, cooked for you from scratch at your venue, you can’t get better than a Taste the Cracklin hog roast. Contact us today to talk through your requirements and we’ll do our utmost to ensure we can provide the catering experience you require for your event, wedding or party.